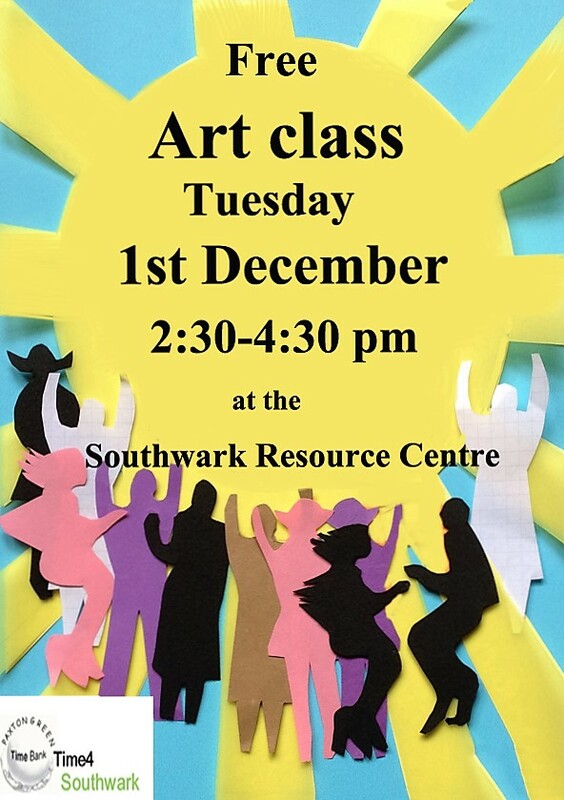 Tuesday 1st December – Time 4 Southwark Art Class : Free Drawing Sessions for all levels. 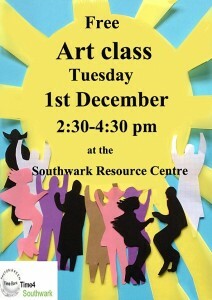 Venue: Southwark Resource Centre,10 Bradenham Close, Walworth London SE17 2QB 2:30—4:30pm. Call us on 0208 670 0990 for more information. Monday 7th December: Italian Classes Venue: Kingswood House, 11.00 –12pm The Italian classes are held weekly, Anna our tutor, continues to inspire members who attend each week. Wednesday 9th December: End of Year Social Event “Get together” Kingswood House, 5pm—9.30pm We are thrilled to announce that our members are hosting an end of year event. Please join us for Mulled wine, nibbles and entertainment. We look forward to celebrating this event with you. Wednesdays: The Time Bank Choir Venue: Kingswood House, 5.00—6.30pm. The Choir continues to meets weekly, on a Wednesday evening. Members of the Choir have been working tirelessly preparing for their performance at the Shakespeare Globe in London on the 10th December. The Choir will also be performing Christmas Carols on the 4th December at Dulwich Wood Primary School’s Christmas Fete. “Next stop the XFACTOR” Thanks again to all members for their dedication and hard work. For further information on either of these events please contact the office on 020 8 670 0990. Time Bank Action Group : Venue : Kingswood House 10:30—12:30 The Time Bank Action Group continue to drive innovation in developing and establishing projects and activities for members. Much thanks to members for their dedication and hard work. The Action Group will meet up again in the new year. Please contact us to share ideas – from group trips, activities, to setting up groups, please let us know and earn 2 credits.